Puritan preacher John Bunyan authored his classic allegory over 300 years ago. Now an award-winning director and his team—including some Pixar talent—are bringing it to the big screen. First published in 1678, the allegory by Puritan minister John Bunyan has long been ranked as one of the Top 10 most-printed books in history. Referenced by figures from preacher Charles Spurgeon to humorist Mark Twain to apologist C.S. Lewis, its influence has marked the church and popular culture for centuries. A fast-paced, action-packed adaptation, The Pilgrim’s Progress features voice actors including John Rhys-Davies (The Lord of the Rings), Ben Price (Audacity) and Christian singer/songwriter Kristyn Getty. Director Robert Fernandez spoke from California about the story’s remarkable origins, their missions focus with the film … and some unforeseen animation help along the way. The interview has been lightly edited for clarity. Why is John Bunyan’s classic allegory relevant for today? Robert Fernandez: There is no way John Bunyan could have anticipated the influence his story would have in the centuries to come. He wrote The Pilgrim’s Progress in a prison cell, because he was prohibited from preaching. God had been working on his heart, and I think he used Bunyan because he was willing to pay the price. This allegory shows what following Christ is really all about. 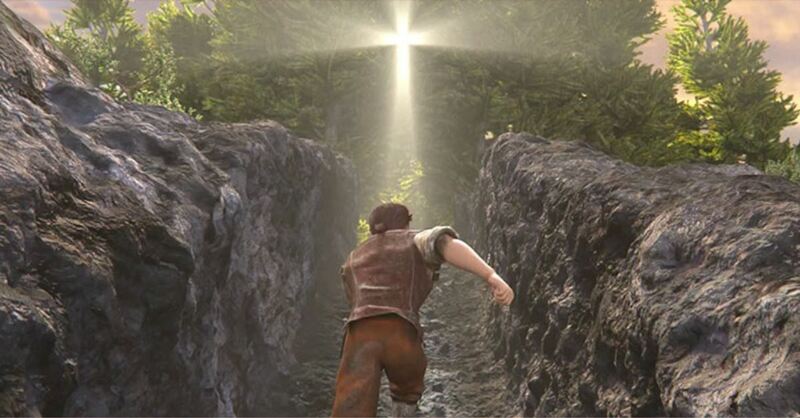 It illustrates his call to believers: “Take up your cross and follow me.” It was a truth embedded in Bunyan’s heart, who received it from the Gospel. The story came from his soul and innermost being. On most things I work on, it’s always a challenge to consider two audiences. If it’s a believing audience, how can the story serve as an inspiration or conviction? It needs to be a catalyst in believers’ hearts. But if a nonbeliever comes in without any form of faith, how can they catch up and understand what it means? This animated version doesn’t digress from the original story at all. In the book, it begins with Christian and his burden, making a decision to flee the City of Destruction. We went in a little deeper to try to explain things visually. That’s why we started our film with a short backstory on the city, revealing how the enemy Apollyon is behind it. How did you come to be interested in this story and the life of John Bunyan? Fernandez: I’ve been working in animation for the past 20 years. My work often has a strong focus on children. When the whole family watches, the stories speak to adults as well. Beyond writing, I got more heavily involved in the process when I became the producer for The Torchlighters — an ongoing series in partnership with Vision Video and Christian History Institute. Each animated half-hour presents a true-life Christian hero, such as Jim Elliott, Harriet Tubman, Eric Liddell, Amy Carmichael and John Wesley. I think we’re on the 18th episode now. You use your craft to pull all the historical research into a comprehensive story. At the same time, we weave in the ways God works in that particular individual to bring about his will. These well-known Christians never had any idea of what God was going to do with their lives. They often ask the same questions, like: Is this what you want me to do, God? We did one on John Bunyan. With each story, we produce a documentary filmed on-location. Our team has filmed in Tunisia, China, Rome, all over the world. For the Bunyan episode, we did all the recording in London and visited Bedford — including the actual prison cell he was in. Bunyan had a family and his wife stood by him. She and his children sacrificed too, it wasn’t just him. Eventually, he won over one of the caretakers and was allowed to go home every once in a while and continued preaching. To create a feature-length animated movie, who were some of the talent involved? Fernandez: You meet a lot of people making a film like The Pilgrim’s Progress. My role as director, including overseeing all the character designs and art, connected me to many artists. In working on the script, I always get these pictures of what I want and start making sketches. When I started to work on character designs, you have to include everything. If they wear shoes, is it buckles or shoelaces? What are the size and color? How worn is it? It has to be that specific for the animators to use. As I was doing research, I came across some great sketches for an animated project that never happened. I got in touch with the artist, who I learned is this Christian guy who works at Pixar. He had done designs and backgrounds for Toy Story and Cars. He worked with me for about six months on this film, then got called away to do The Good Dinosaur. You encounter people like that along the way who are believers. In other cases, you hire people who have no belief system who begin working on a project like this. Because it’s animation, they have to look at the scenes over and over again. God begins using those passages and concepts they’re working on, and it begins to affect their hearts. How are you and the team of producers using this film in global mission efforts? Fernandez: Our plan is to give it to the mission field. Right now, it’s being dubbed into Spanish, Farsi, Korean, and Mandarin—with other languages in the works. We want it to be used to evangelize, but I think it’s going to go beyond that. It’s a story that disciples people. We did a test screening at one point for pastors. Afterward, I was speaking to a minister who said: “There were so many parts where I wanted to just stop, think and let it sink in.” It’s a story that is great to watch and be inspired by it. But it could also be episodic — where you could stop and discuss it. We’re working on a curriculum study to go along with it. Bunyan was so anointed and inspired by God to depict the different stages of Christian growth that we go through. For people around the world, it will equip them for what the Christian journey is really all about. What do you hope audiences take away after seeing this film in theaters? Fernandez: One thing that resonates in this project, and I see it in my walk with the Lord, is how trials and tests bring us to desperation. Life has a lot of ups and downs. Sometimes you have situations that are going great, and parallel to that you have really tough situations — whether it’s your family or yourself. Evangelist replies, “No, something even more difficult. One or both of you will seal your testimony with blood.” They are confronted with true Christianity. The essence and foundation of the Christian faith are great devotion and intimate love, which translate into obedience in the believer’s heart. I hope people walk away with a greater understanding and inspiration to want to serve the true God. In each of our journeys, we must be willing to go through the Valley of Humiliation, turn away from Mr. Legality and Mr. Worldly Wiseman — and constantly hang on to the Lord with that vision of the Celestial City in our hearts. Rated PG for mild thematic elements and scary images, The Pilgrim’s Progress will play in movie theaters for two nights only on April 18 and 20. Josh M. Shepherd covers culture, faith, and public policy issues for media outlets including The Stream and The Federalist. A graduate of the University of Colorado, he previously worked on staff at The Heritage Foundation and Focus on the Family. Josh and his wife live in the Washington, DC, area with their son.